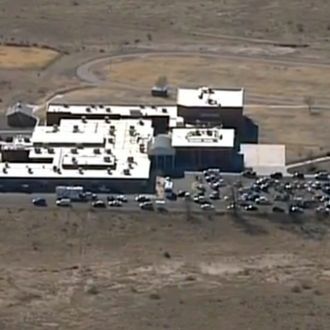 A 12-year-old boy and a 13-year-old girl are reportedly in critical condition following a shooting this morning at Berrendo Middle School in Roswell, New Mexico. A suspect — described as a male student — is in custody, according to the local police. “I turned around and all I saw was someone on the floor with their arm bleeding,” said a sixth-grade witness. The situation is developing. It’s been less than a month (including time off for the holidays) since the last school shooting, at Arapahoe High School in Colorado, which left a 17-year-old girl dead. The 18-year-old shooter, upset after “losing his coveted spot on the debate team,” killed himself with a shotgun. Update: The suspect in custody is reportedly 12-years-old, police said in an afternoon press conference. According to New Mexico Governor Susana Martinez, a school staffer stopped the shooting by telling the boy to put the gun down. The adult suffered minor injuries, but was not hospitalized.